Reaching from the Brist ol Channel in the north to the English Channel in the south. 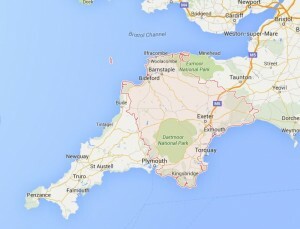 It is part of South West England, bounded by Cornwall to the west, Somerset to the northeast, and Dorset to the east. The City of Exeter is the county town; seven other districts of East Devon, Mid Devon, North Devon, South Hams, Teignbridge, Torridge, and West Devon are under the jurisdiction of Devon County Council; Plymouth and Torbay are each a part of Devon but administered as unitary authorities. Combined as a ceremonial county, Devon’s area is 6,707 km2 (2,590 square miles) and its population is about 1.1 million. Visit Devon and you’ll find that there is more to this spectacular and diverse county than you might have thought. In addition to beautiful beaches and stunning scenery, you’ll find National Parks, rustic villages and towns, historic buildings and ruins, extreme sports and the best in food and drink. Torquay is the gateway to the English Riviera – an area that is packed with things to do in Devon, England. Torquay is steeped in maritime history and plays host to a number of sporting events and festivals, including the Riviera’s own regatta. North Devon is home to a number of stunning stately homes set in glorious grounds, and some of the county’s best surfing beaches for adrenaline junkies. It too has its own distinct character, and the dramatic beauty of Exmoor is the perfect location to go hiking or mountain biking. Exeter also has its fair share of history, parts of the city centre dating back to Roman times, with over 70% of the roman wall still remaining. However, it also boasts a superb high street, cobbled side streets and squares housing high street and independent shops and boutiques. Plymouth might be located in Devon, but it has its own distinctive character. Plymouth is a city for family holidays in Devon. Steeped in history and the scene of Sir Francis Drake’s legendary game of bowls, Plymouth is also hailed as the cultural centre of the county. If you’re planning on moving to this beautiful county you should start thinking about which removal companies in Devon are the best. If you plan your move in advance you will be able to compare quotes from many local companies. South Devon offers the best of countryside and coastline, whichever way you choose to enjoy it. The area is packed with water sports and gentle walks and there are plenty of bars and restaurants to enjoy. Blue Flag beach, and one of the most stunning in the while region. A large shingle, beach surrounded by evergreen trees. Shaldon beach is located at the mouth of the River Teign and is a gently sloping mix of sand and shingle that levels out at the river estuary. This beach is long and sandy with water shallow enough for children to swim safely, and lively enough for water sports enthusiasts further out. A large open beach, suitable for surfing, with stunning views of Burgh Island and the South Hams coastline. Since the rise of seaside resorts with the arrival of the railways in the 19th century, Devon’s economy has been heavily reliant on tourism. The county’s economy followed the declining trend of British seaside resorts since the mid-20th century, but with some recent revival and regeneration of its resorts, particularly focused around camping; sports such as surfing, cycling, sailing and heritage. This revival has been aided by the designation of much of Devon’s countryside and coastline as the Dartmoor and Exmoor national parks, and the Jurassic Coast and Cornwall and West Devon Mining Landscape World Heritage Sites. Devon generally has a mild climate, heavily influenced by the North Atlantic Drift. In winter snow is relatively uncommon away from high land, although there are exceptions, such as the snowfalls of February 2009, and December 2010. The county has warm summers with occasional hot spells and cool rainy periods. Winters are generally mild and the county often experiences some of the mildest winters in the world for its latitude, with average daily maximum temperatures in January approaching 10 °C (50 °F).